100% high quality Leather, well made and beautiful supple leather,long time use. Simple design vintage buckle belt, easy to match your dress or jeans. 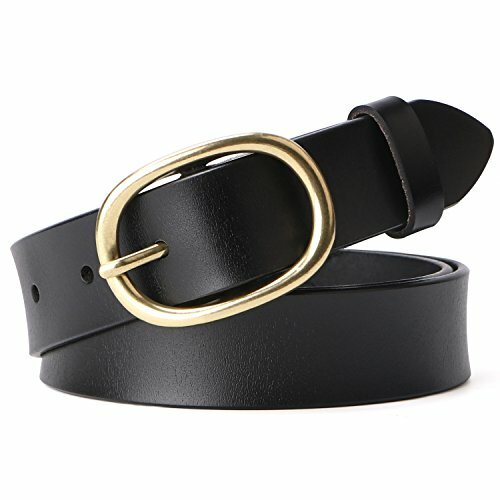 The Nice Leather belt come with a puncher, you can DIY the length if the belt is too long for you. 1. We provide 100% satisfaction and 180 days warranty on our products. 2. If any questions or concerns, we will respond your email soon with a satisfied solution. Material: The women belt is made from a double-sided first layer of cow-skin leather material with full efficiency and is an incredible well-made product. Its quality is at its best, it offers genuine leather with great durability. It is a classic jeans belt which is a must have. This women's belt will bring you to the modern style with the brown and black white color and this belt can be used for long days. It is also suitable for you to use when you are going to work, study or go to some place and it also matches with any clothes. Long Time Use. Well made and beautiful supple leather with classic buckle. Simple design, but fits with every outfit.It's comfortable to wear, nice for dress up,perfect for your dress, jeans and pants. Great price! Shipped in a nice box with instructions and tools included to customize the size of the belt. You can easily cut the belt to adjust the size without ruining the look.It also perfect as the gift for your friends or family. Seller Promise - 45 days free exchange, 360 days warranty. Click the seller name below the "In Stock" to contact us with any questions. You will get satisfying reply within one business day. MONIQUE Women High Waist Crocodile Print Patent Leather Fashion 3'' Wide Belt,Silver XS - 28"
MONIQUE Women Square Nickel Free Snap On Plain Synthetic Leather 38mm Belt,Black M/L - 34"~36"